The Kasteelberg range of wines, celebrates the discovery of Riebeek and the Kasteelberg mountains in 1661. Kasteelberg stands sentinel over the fertile valley below. From the slopes of the mountains, hand-selected grapes are expertly crafted with care to produce rare and expressive wines. The Kasteelberg range truly is the pinnacle of our Winemaker's art. Often referred to as Shiraz Country, the Riebeek Valley is renowned for exceptional Shiraz wines. 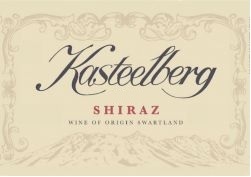 The Kasteelberg Shiraz is a lively rich wine, full bodied with a subdued smokiness on the nose and a pallet of ripe fruit and interesting spice. Well-balanced and smooth, the aftertaste lingers with the exciting flavors of Christmas pudding. Serve at room temperature. The perfect companion to barbequed lamb, fillet medallions and game. Lovely with Springbok stuffed with bacon, garlic and rosemary and a great match to a cheese and preserve platter. Riebeek Cellars was established in 1941 and is situated in Riebeek Kasteel at the foot of Bothma's Kloof Pass. This medium-sized winery on the western coast of the Cape Province of South Africa sources its grapes from the fertile Riebeek Valley and the slopes of the mountain where the climate is very similar to the Mediterranean. Through the years as vineyard practices developed, cultivars were planted in soil and at slopes best suited to them. These well-tended vineyards enable the production of high quality wines which makes Riebeek Cellars the choice of wine buyers internationally. Well-known both in South Africa and abroad, Riebeek Cellars manages a variety of brands for various countries. Corporal Pieter Cruythoff, a scout of Jan van Riebeeck, founded the Riebeek Valley in 1661. Impressed by the single standing mountain, he called it Kasteelberg (“Castle Mountain”) commemorating the Castle of Good Hope in Cape Town, the fortress of Commander Jan van Riebeeck. The twin towns, Riebeek Kasteel and Riebeek West, established at the foot of Kasteelberg, are therefore also suitably named after Van Riebeeck. The Riebeek Valley is a mecca of wonderful wines, exceptional food and exquisite art where tourists and locals alike are forever tempted into spending more time than allowed. The serene valley falls in the bigger Swartland region which is called the 'bread basket' of South Africa for its grain production, while it is further internationally acclaimed for its high quality olive products. With various hotels and fine-dining restaurants as well as true country hospitality, the Riebeek Valley has become a very popular tourist destination. The ultimate charm of Riebeek is however in its people and their commitment and passion for wine. "Located in the Western Cape region of South Africa, this winery was established in 1941, which makes it relatively old compared to all the new wineries that have sprung up in this area. Among the first Pinotages I can recommend, it’s also a good value. Pinotage, which is, of course, ubiquitous in South Africa, was first made in 1941, when the Cinsault grape (primarily grown in southern France and the Rhone Valley) was crossed with Pinot Noir." - Robert Parker's Wine Advocate (Issue 201, June 2012). Rubus Old Vine Shiraz Barossa Valley is a blend of 98% Shiraz & 2% Viognier, this richly concentrated Barossa Shiraz is indicative of the style for which Australia's top production region is famous. The wine is dark in color, rich and dense. There are ample tannins balanced by the powerful fruit. You will note the hints of blackberries, mint, and eucalyptus flavors upfront and in the finish. Try Rubus Barossa Shiraz with rich dishes like lamb shank, Osso bucco, beef steak or roast duck. "Blackberry, currant and blueberry flavors are dense, intense and powerful, mingling with black licorice, sage and spice notes, with a brambly undertone. A spicy hint lingers on the finish. Drink now through 2030. 1,200 cases made. - MaryAnn Worobiec"